Tig Welding Filler Wire is required when TIG welding either thick metal or a joint that needs to be reinforced.The Tig filler rod that is used must be the same composition as the base metal. Tokentools stock in the online shop Tig filler rod for TIG welding both stainless steel and aluminum.The stainless steel Tig filler rods can be found in the Tig welding filler wire category.The shop generally only stocks 1.6mm stainless steel rods and 2.4mm aluminium rods. As a side note be sure not to use the steel rod designed for oxy-acetylene welding as it is not pure enough for use in TIG welding and can contaminate the tungsten electrode. 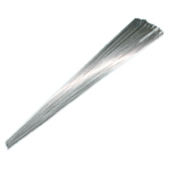 Stainless Steel TIG Welding Filler Wire 316LSi 316 LSi Stainless Filler Wire for Tig Welding stainless steels 5 kilogram pack used for weld projects requiring Tig filler rods and stainless tig filler wire.